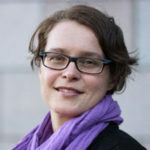 Christiane Wilke was at IILJ from 2003-2004 as a Visiting Doctoral Researcher. She is currently an associate professor and graduate supervisor at Carleton University. Prof. Wilke’s research examines how people deal with massive violence, and specifically how they talk about violence in legal categories. One of her projects investigates how criminal trials for state repression in Argentina and Germany helped to create certain imaginaries of perpetrators and responsibility, of law and legality, and of suffering and victimhood. Her new project (part of a SSHRC funded interdisciplinary collaboration) investigates how people made specific forms of violence such as bombing, genocide, and enforced disappearances visible to international law. This project involves an inquiry into the ways in which international law takes notice of violence and declares it a matter of international concern. It also involves an examination of the strategies by which social movements succeeded in making specific forms of violence a matter of concern for international criminal law. The project will also consider the effects of international criminal law’s specific modes of seeing violence on conflicts, identity politics, and advocacy.